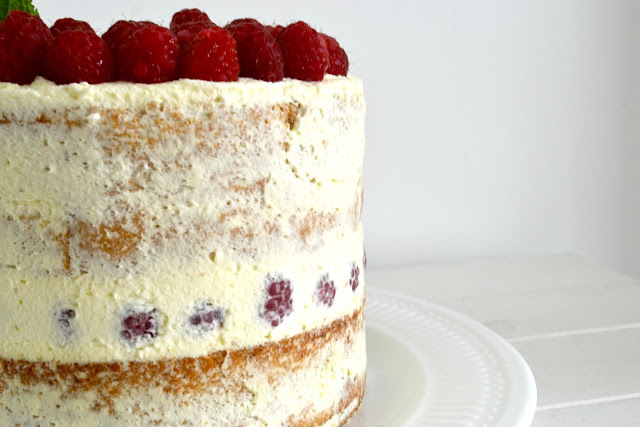 Procrastibake: Genoise and Raspberries and Cream... Oh my!! There was no way I was going to pass up a Genoise Sponge when I saw it on The Cake Slice Bakers list this month. 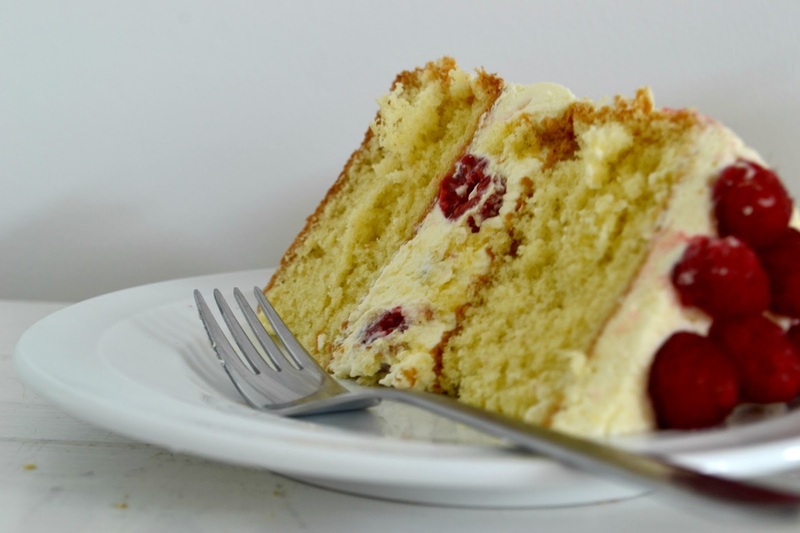 It is one of my favourite sponges, light and airy and perfect with fresh fruit and cream. I was excited to see how Roger Pizey of World Class Cakes made his and followed the instructions in earnest. But alas, it was pretty much the same as every other Genoise recipe I have tried. Not that that was a bad thing, but there was nothing a teeny bit special about it. I did not however, use a the sugar syrup mentioned in the recipe. I really dislike, with all my baking heart sugar syrups used on cake layers to keep them moist. My understanding is, if you have to pour sugar water onto your dried out old sponge, then your recipe is wrong. Maybe that's the novice in me and someone can enlighten... I would love to stand corrected. Syrups as glazes and flavours, you can proceed, but sugar water.. YUCK!!! What the recipe did make for though, was an exceptionally light sponge, that melted in your mouth. There was no need for the sugar syrup in my opinion. The Chantilly Cream, a basic in most kitchens was a lovely accompaniment to the raspberries, not as sweet at this time of year and which happened to be on sale in my local store this week. And good thing too as there are a lot needed for this recipe. The recipe it self called for one 8' round. Now. looking at the pictures in the book, I did not think the cake displayed was as small as an 8 inch. But I trusted the book.. I should have went with my gut. I opted to split the batter into two 6' pans, which actually resulted in me using three 6 inch pans and then ended up with double height cakes. You will see in the pictures below, they are very deep layers. Again, not a complaint.. the cake was ate up in no time, just something that I felt coming and ignored. Preheat the oven to 170°C/325F or gas mark 3. 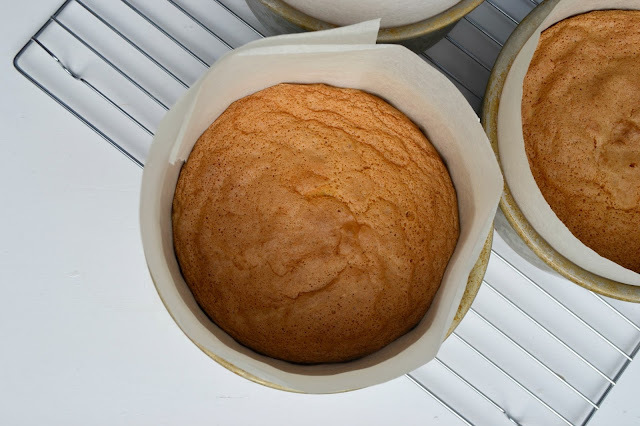 Line two 8 inch round cake pan or three 6 inch with baking parchment. In a large bowl, whisk the eggs until white and foamy. Slowly add the sugar and beat until the mixture has trebled in size. Sift the flour and plain flour together and fold it, using a large metal spoon into the egg mixture, carefully. Once incorporated, fold in the melted butter. Pour the mixture into the prepared pans and bake in a preheated oven for 25-35 minutes or until a skewer inserted in the middles comes out clean. Remove from the oven, allow to cool for 10 minutes in the pan and then turn out onto a wire rack to cool fully. While the cake is cooling make the Chantilly Cream. Whip the cream to soft peaks, sift in the icing sugar and continue to whip the cream until thick, stable ribbons form. Store in the fridge until needed. Once the cakes are cooled, spread a layer of the Chantilly cream on the bottom layer before arranging the fresh raspberries in circles on top. 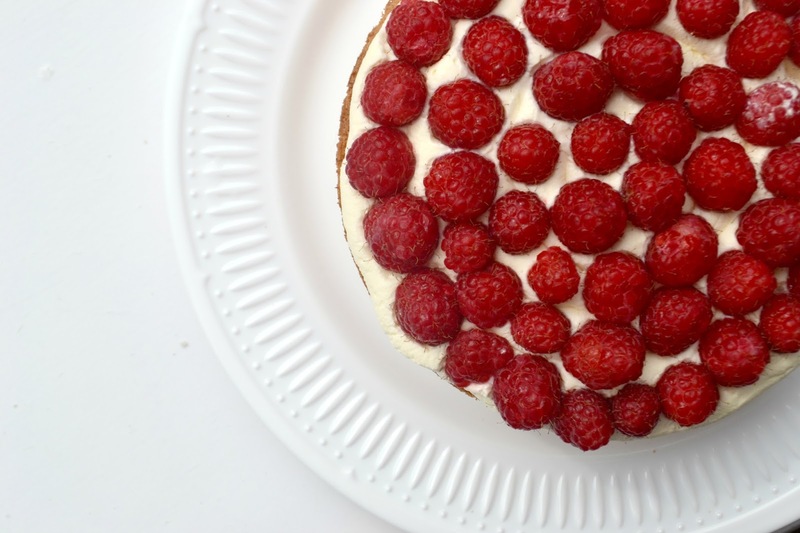 Cover the raspberries with another layer of cream and then place the top layer of cake on the raspberries. 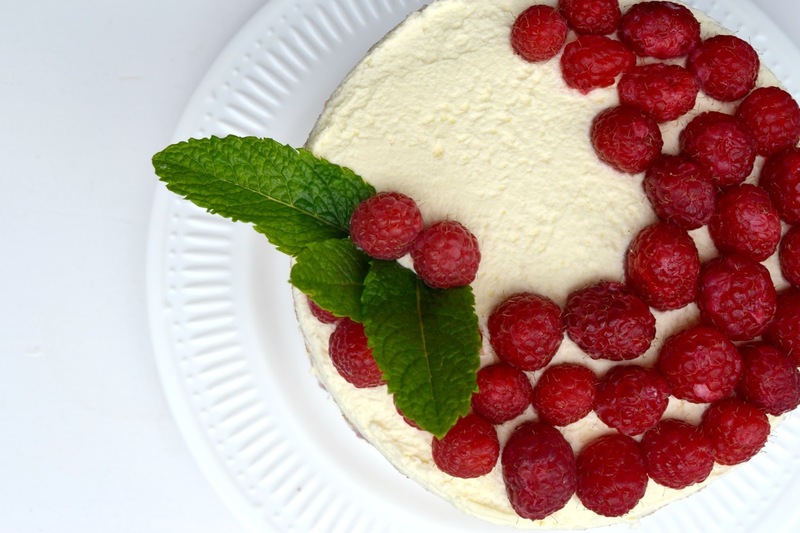 Spread a layer of cream on the very top (and sides if you wish) and place more raspberries. So what do you think? It's worth a shot for sure.. 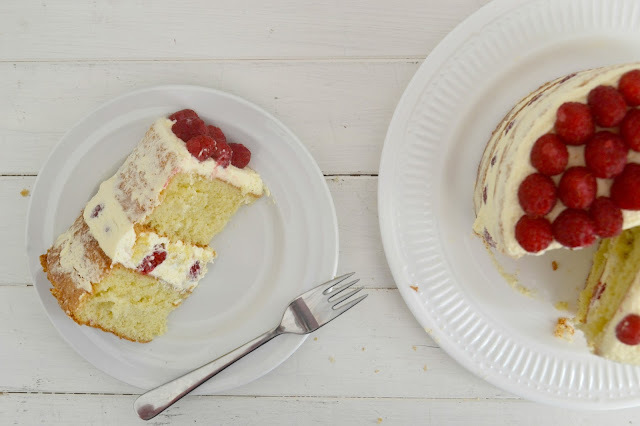 I know it will be a hit because who doesn't love cake and cream and fruit when the summer is fast approaching!! What a beautiful cake! I love how the finished product looks. I do have to say that I've made a few cakes with syrups lately and do enjoy the texture it gives, but it does seem a bit crazy when you think about it! Beautiful, Hazel! I agree on the simple syrups - seems like you'd just have wet cake! Looks lovely! 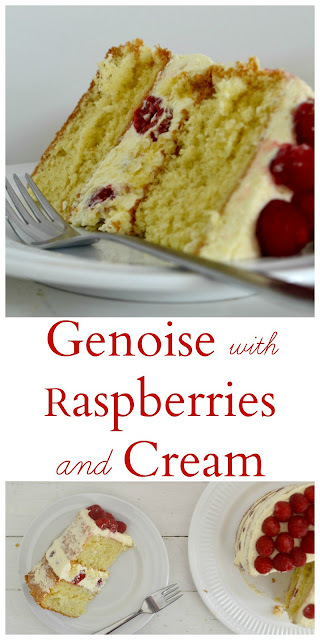 Glad to hear that it was a traditional genoise- it doesn't make me feel bad for skipping it. I love it too though! Wow Hazel, your cake looks amazing and I love that you decorated it as a naked cake. Also, I totally agree about the raspberries. I love them, but they are usually so expensive. Luckily I found a larger punnet at Sam's Club for a reasonable price or it would have been a very expensive cake. This is so pretty! I agree, if a cake needs syrup something is either wrong with the recipe or it is overbaked. I wanted to try this one but it seemed like a lot of steps! What a pretty cake! Raspberries are very expensive and not easy to find over here. Your cake looks delicious! Perfectly baked! Love love your naked cake sides! Perfect, as always! As long as there is liquor in the syrup, fine by me, hahaha! Oh Hazel, I swoon looking at your perfectly fluffy genoise sponge! I need to know your secrets. It is sooooo perfect. Wasn't this a lovely bake? We quite enjoyed it at my house. This cake is definitely on my to do list. Yours looks absolutely delicious.